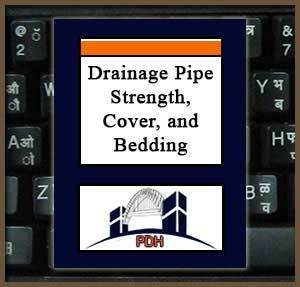 This course provides an introduction to drainage pipe strength, cover and bedding. A drainage pipe is defined as a structure (other than a bridge) to convey water through a trench or under a fill or some other obstruction. Materials for permanent-type installations include non-reinforced concrete, reinforced concrete, corrugated steel, asbestos-cement, clay, corrugated aluminum alloy, and structural plate steel pipe. Learn about bedding for culverts and storm drains.. This course is intended for civil engineers and other design and construction professionals wanting an introduction to underground drainage pipe and conduit, and cover and bedding. This course will give civil engineers and other design and construction professionals an introduction to strengths and limitations of different types of drainage pipe and conduit. This is an introduction to methods for drainage pipe and conduit design and construction. This course will give you guidance you can apply when designing drainage systems using buried pipes and conduit.